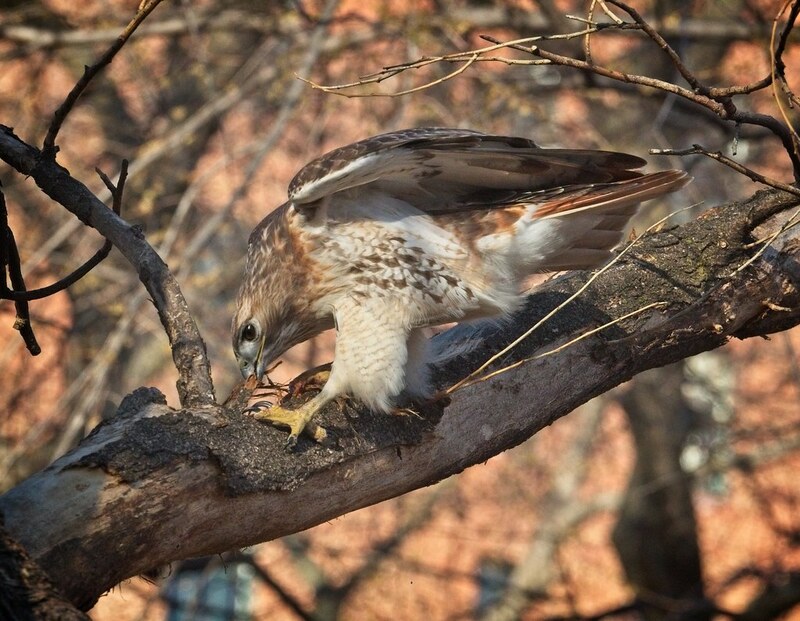 It's been a dramatic week for hawks in Tompkins Square, but things seem to be settling down. 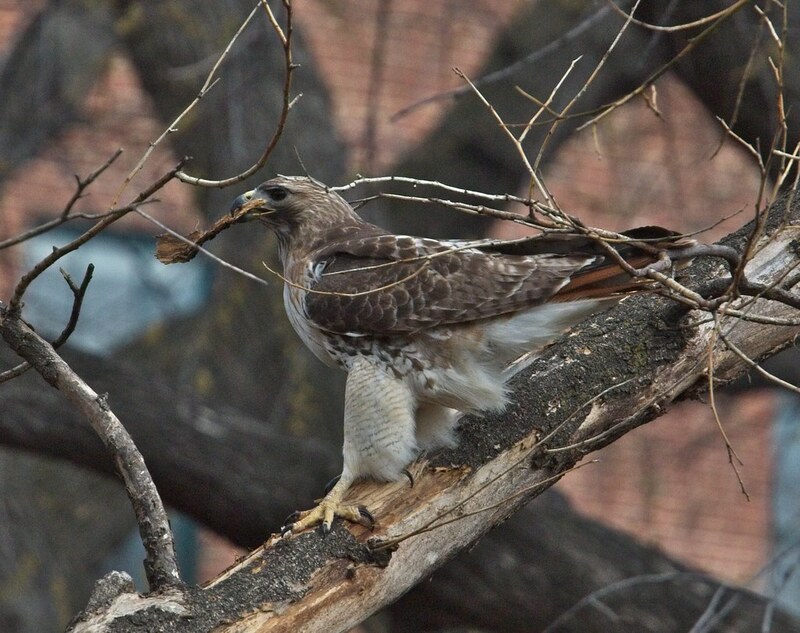 As noted previously, a new female hawk appeared in the Tompkins Square nest just as Dora was being loaded into a carrier to be taken to rehab on April 4. 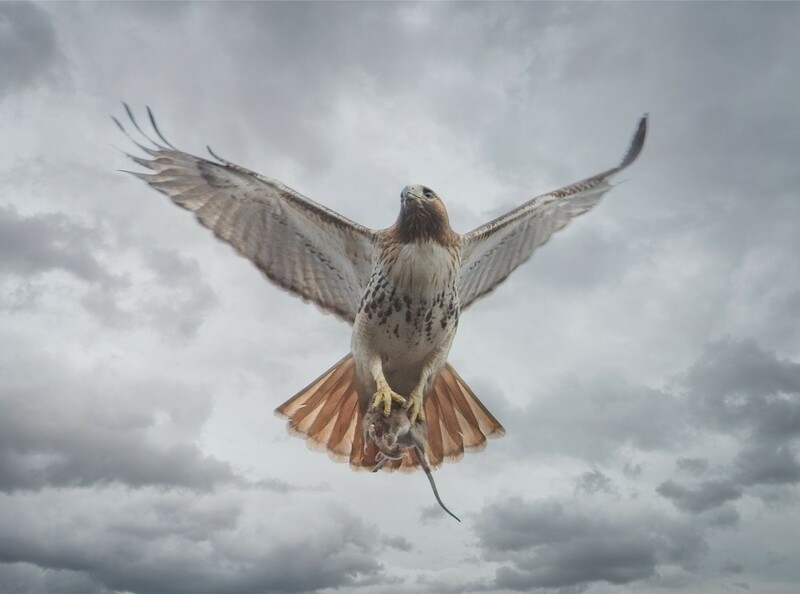 At the time, Christo was perched on the roof of the Christodora building, so he could no doubt see both hawks and knew what was going on. I know a lot of people are upset about this, but if I put myself in Christo's shoes (talons? ), he would have been seeing his longtime, but weakened, mate being taken out of the territory. 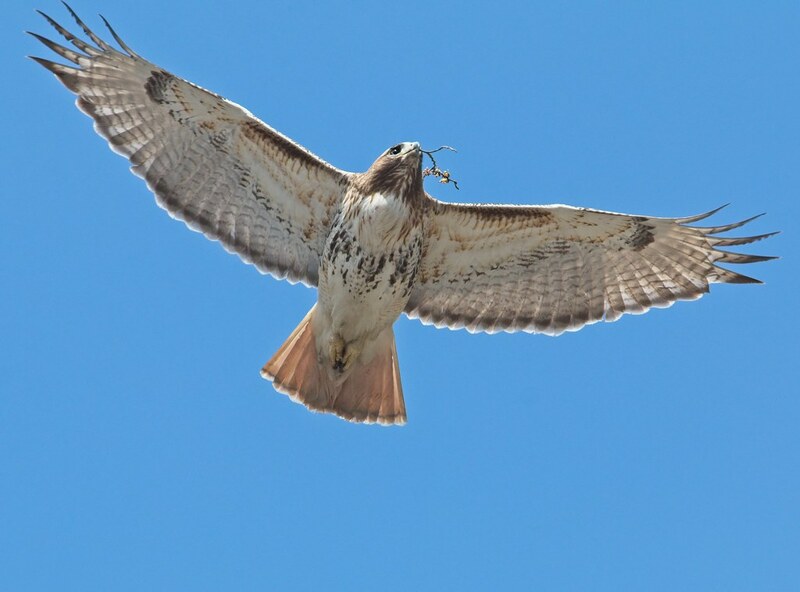 He also would have seen a fully capable female taking care of his nest, the most important thing in his life right now. 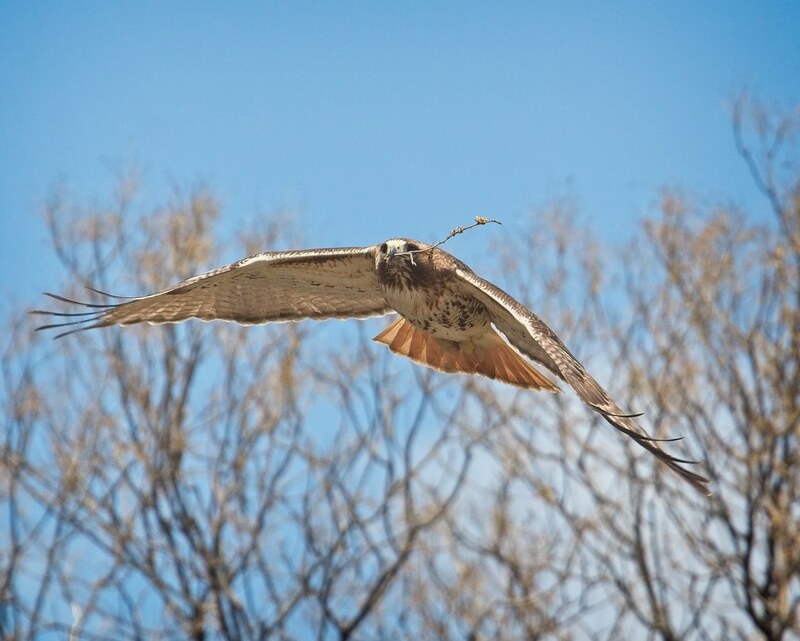 As it's the height of breeding season, the hawks are running on hormones that direct them to build a nest, breed and take care of eggs. The first time I saw Christo mating this season was with Nora/Barucha on February 4. He's been going at it several times a day for over two months! I'm sure he'd like this process to move into the next phase. 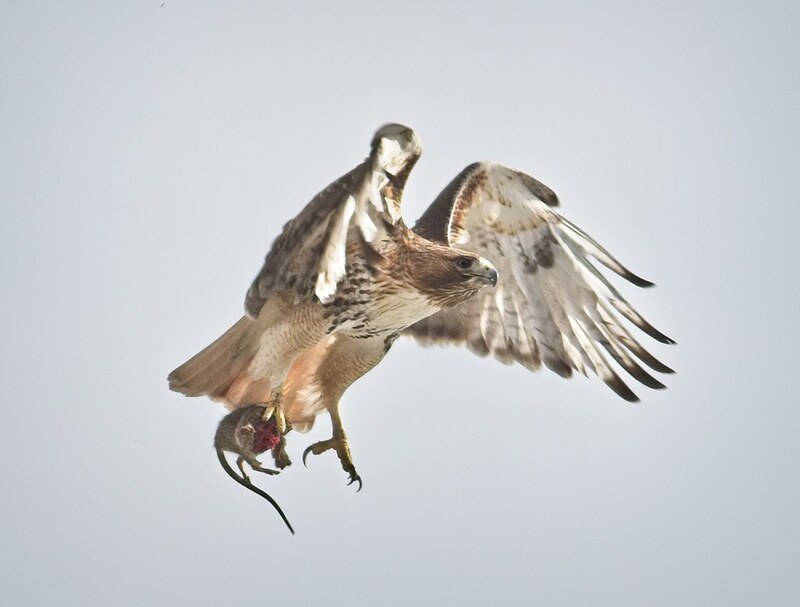 Late in the afternoon, Christo gave her a rat, which she flew around with for several minutes, looking for a place to land and eat. Wednesday afternoon, the winds really kicked up. 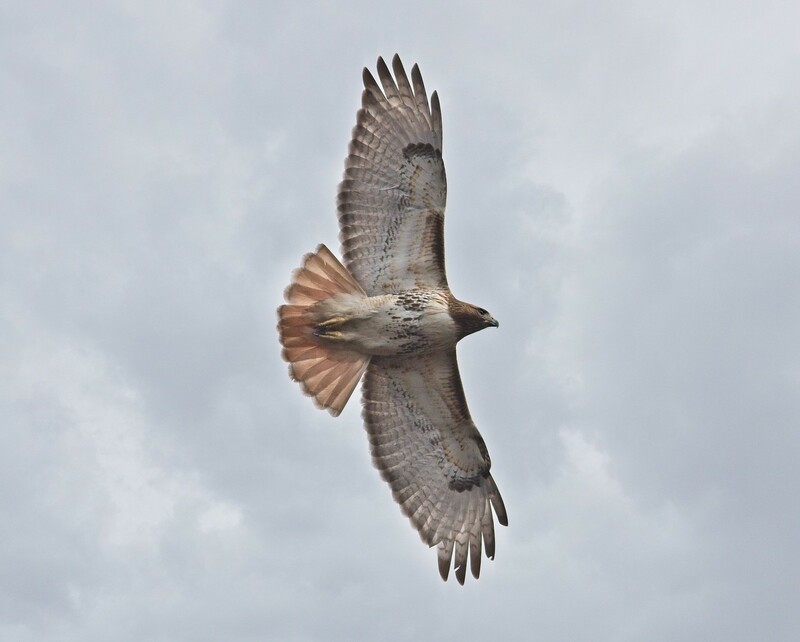 With gusts around 50 MPH, the new hawk demonstrated some stunning aerial maneuvers. 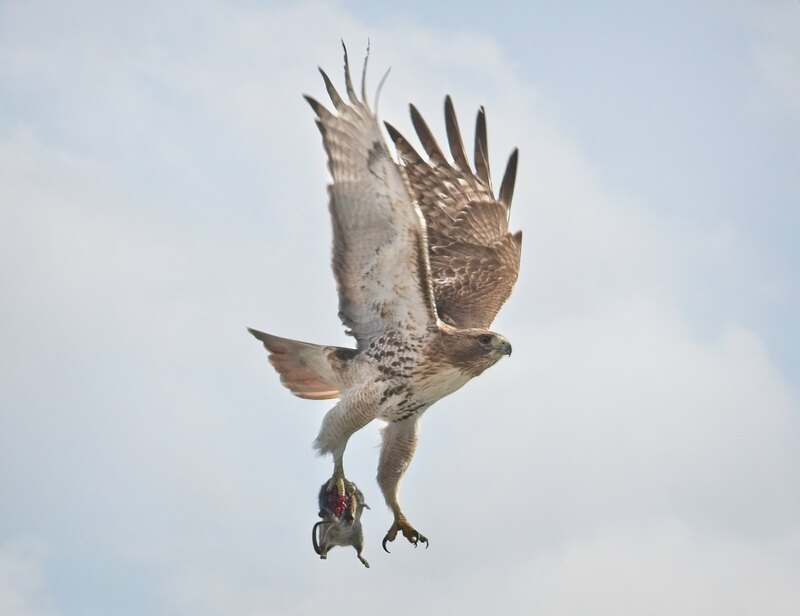 For this reason, a fellow hawk-watcher suggested calling the new girl "Amelia" after Amelia Earhart. 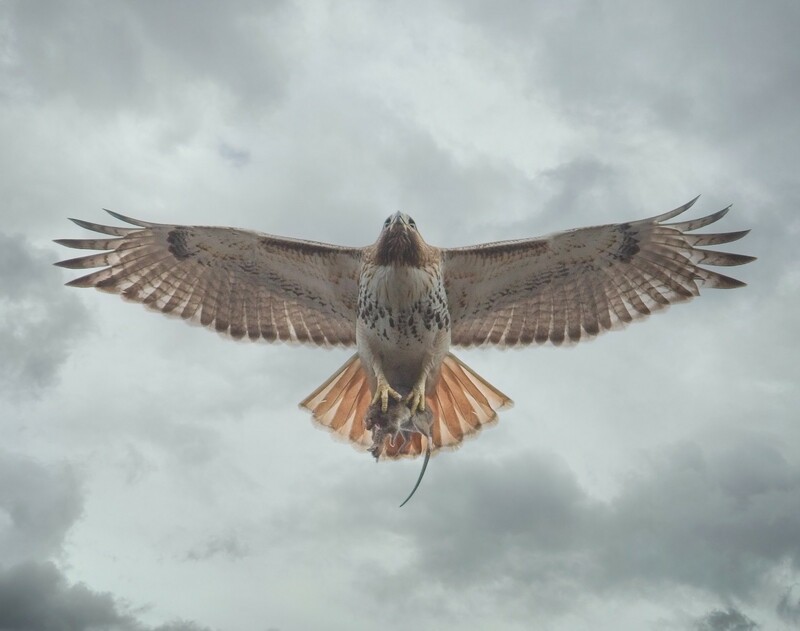 You can call the hawks what ever you want - there are no laws or rules or official forms that need to be filled out - but for this blog, I will refer to her as "Amelia" as I think it's a nice name and it suits her. 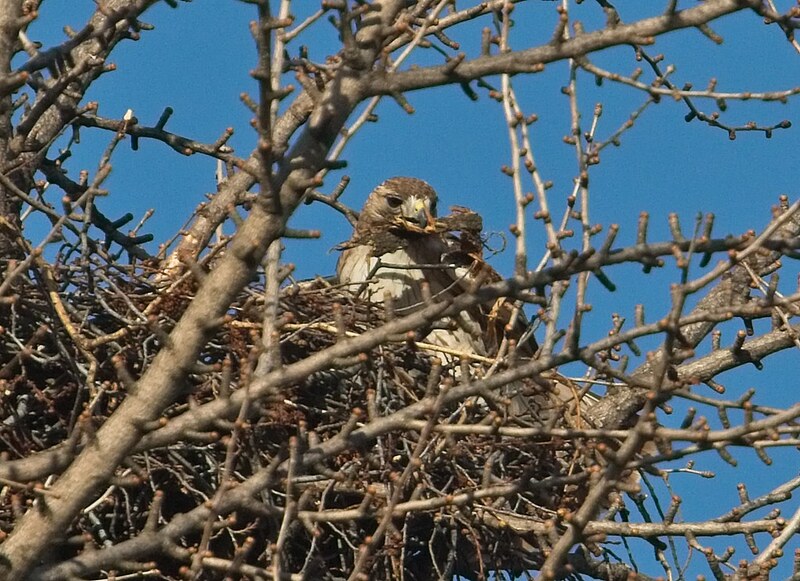 The following day, Thursday, Christo and Amelia spent a lot of time flying around and working on the nest. This is Christo peeling bark from a tree. 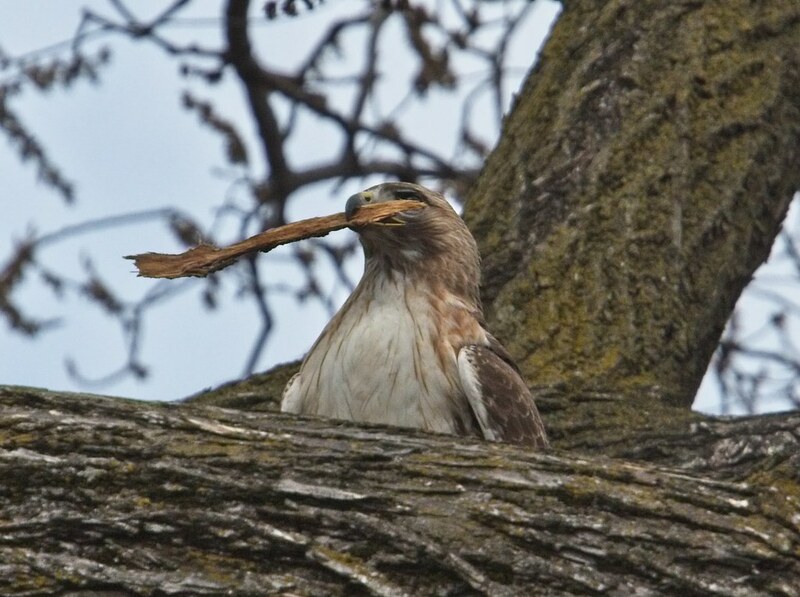 The hawks use the bark to line the inside of the nest. This is Amelia participating by bringing in a small branch. 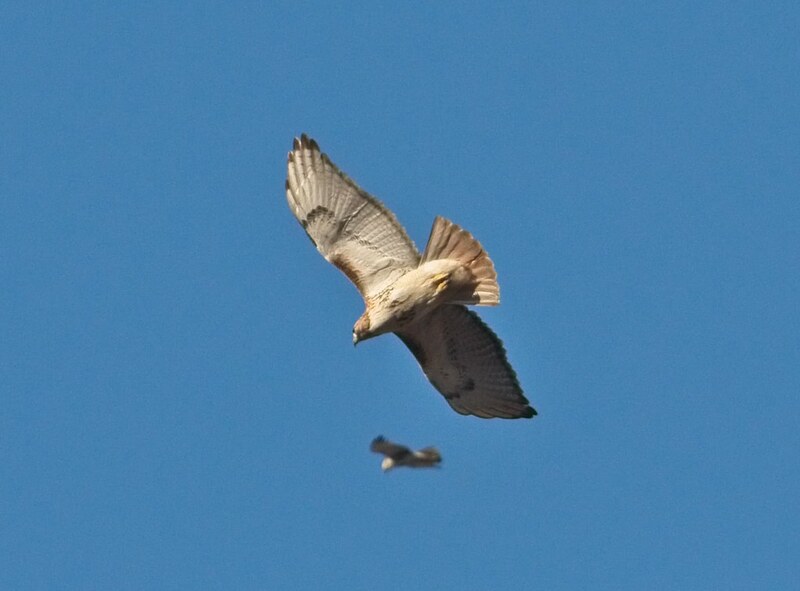 Below, Christo chases off an intruding hawk. 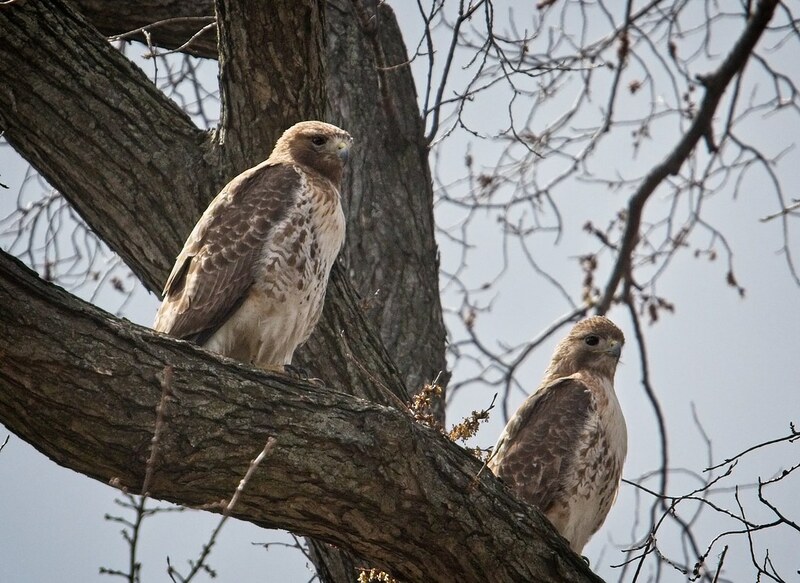 Both hawks have teamed up to defend the territory against other hawks several times in the last few days. Below, Amelia is on the left and Christo is on the right. She's larger than him, and I will do a photographic comparison of Christo, Dora, Nora/Barucha and Amelia in the next post. Last week I was speculating Dora had laid eggs in the nest. All signs suggested she did. However, since the ordeal on April 4, the nest has been left unattended too long too many times for any eggs to be viable. If offspring result from this nest, they will have to come from the new female. 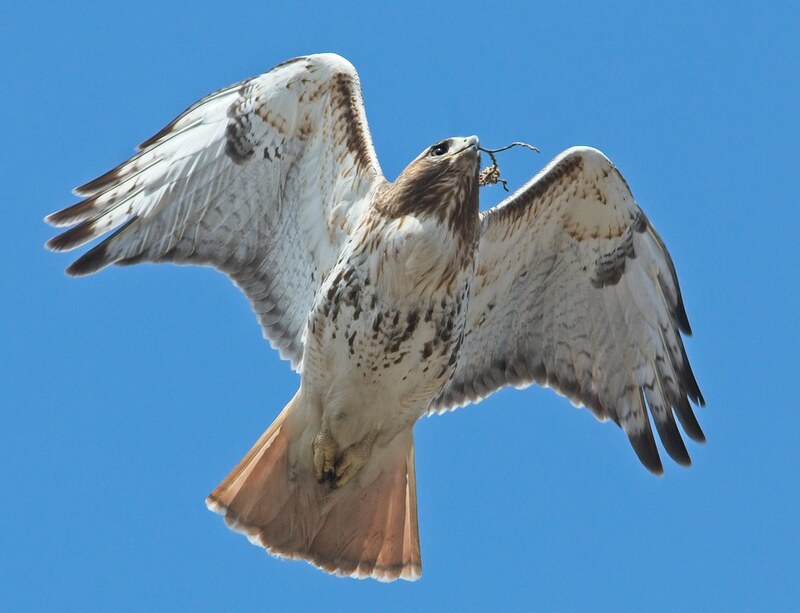 She and Christo have been mating and doing everything right, so there is still hope for eggs and chicks this season.